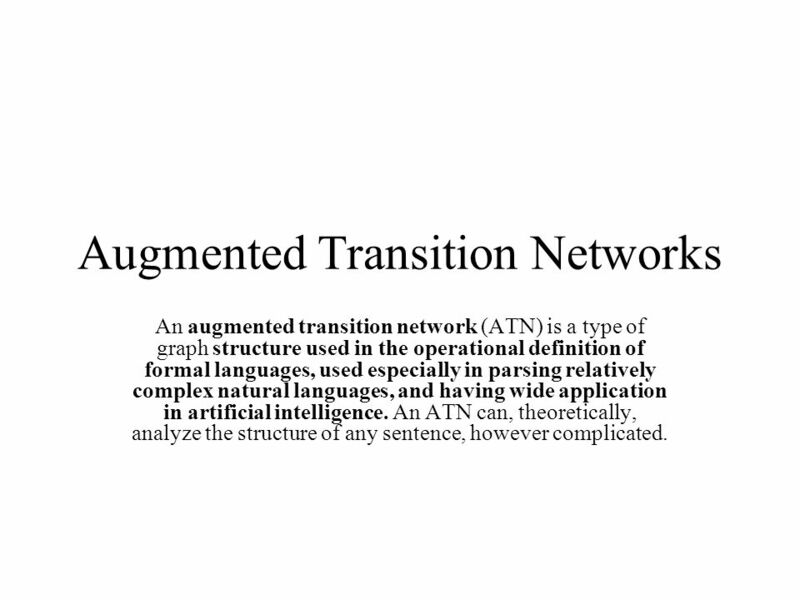 An augmented transition network (ATN) is a type of graph structure used in the operational definition of formal languages, used especially in parsing relatively complex natural languages, and having wide application in artificial intelligence. 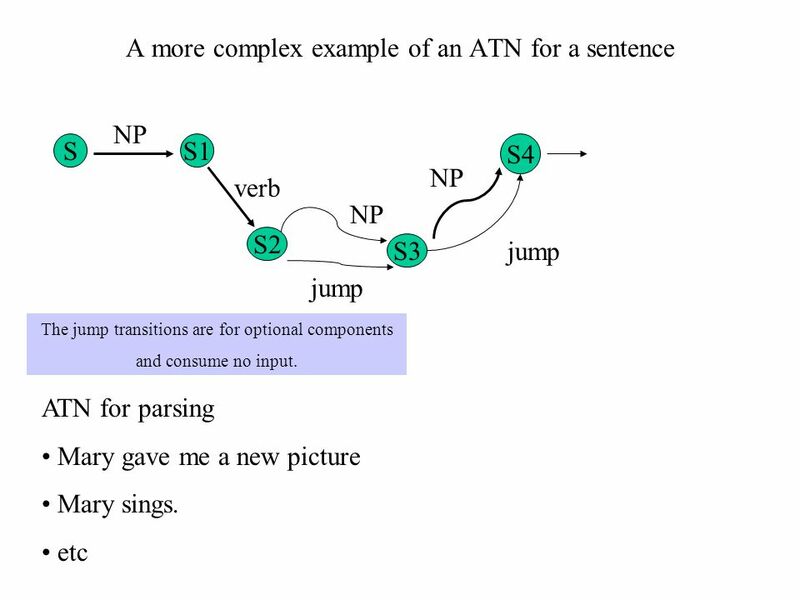 An ATN can, theoretically, analyze the structure of any sentence, however complicated. 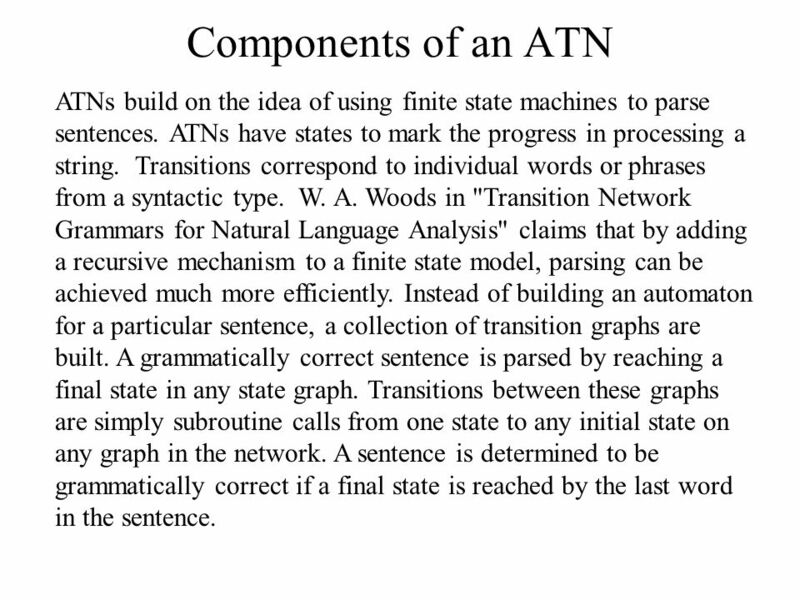 2 Components of an ATN ATNs build on the idea of using finite state machines to parse sentences. ATNs have states to mark the progress in processing a string. Transitions correspond to individual words or phrases from a syntactic type. W. A. Woods in "Transition Network Grammars for Natural Language Analysis" claims that by adding a recursive mechanism to a finite state model, parsing can be achieved much more efficiently. Instead of building an automaton for a particular sentence, a collection of transition graphs are built. A grammatically correct sentence is parsed by reaching a final state in any state graph. Transitions between these graphs are simply subroutine calls from one state to any initial state on any graph in the network. A sentence is determined to be grammatically correct if a final state is reached by the last word in the sentence. The top ATN specifies the structure of a sentence. 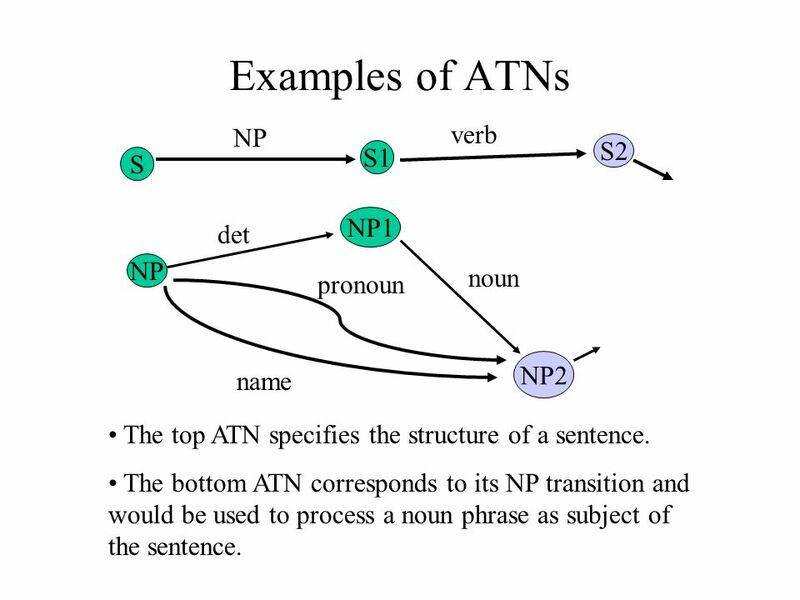 The bottom ATN corresponds to its NP transition and would be used to process a noun phrase as subject of the sentence. 5 Parsing with an ATN Set the ATN pointer to [S] and the source pointer to the 1st word of the sentence. The ATN pointer points to the current node. Select an arc out of the current node which satisfies any associated test and, if the arc is labeled with a word category, the current word must be a member of that category. 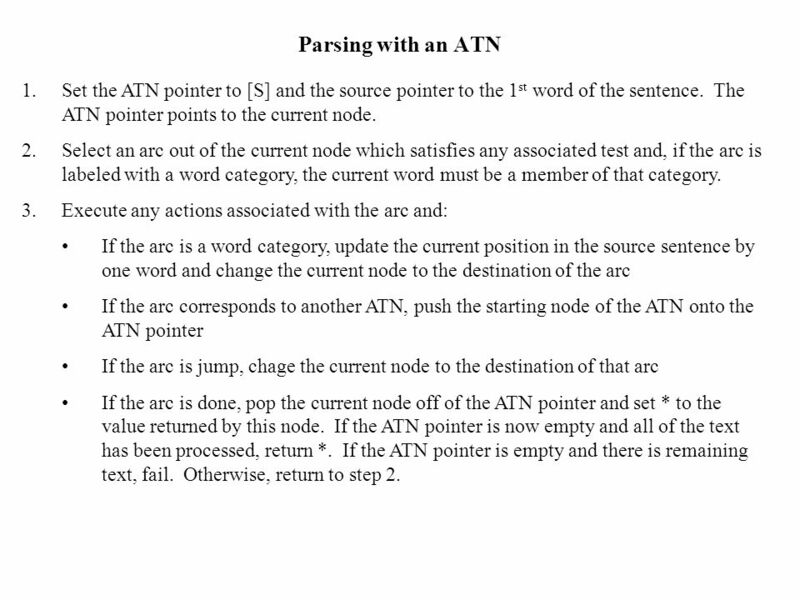 Execute any actions associated with the arc and: If the arc is a word category, update the current position in the source sentence by one word and change the current node to the destination of the arc If the arc corresponds to another ATN, push the starting node of the ATN onto the ATN pointer If the arc is jump, chage the current node to the destination of that arc If the arc is done, pop the current node off of the ATN pointer and set * to the value returned by this node. If the ATN pointer is now empty and all of the text has been processed, return *. If the ATN pointer is empty and there is remaining text, fail. Otherwise, return to step 2. Download ppt "Augmented Transition Networks"
Prolog programming....Dr.Yasser Nada. Chapter 8 Parsing in Prolog Taif University Fall 2010 Dr. Yasser Ahmed nada prolog programming....Dr.Yasser Nada.  Christel Kemke 2007/08 COMP 4060 Natural Language Processing Feature Structures and Unification. Finite State Automata. A very simple and intuitive formalism suitable for certain tasks A bit like a flow chart, but can be used for both recognition. C O N T E X T - F R E E LANGUAGES ( use a grammar to describe a language) 1. Natural Language Understanding Understanding NL (infinite language) means determining the meaning of the sentence with respect to contest in which it is. 1 CS 385 Fall 2006 Chapter 14 Understanding Natural Language Problems. 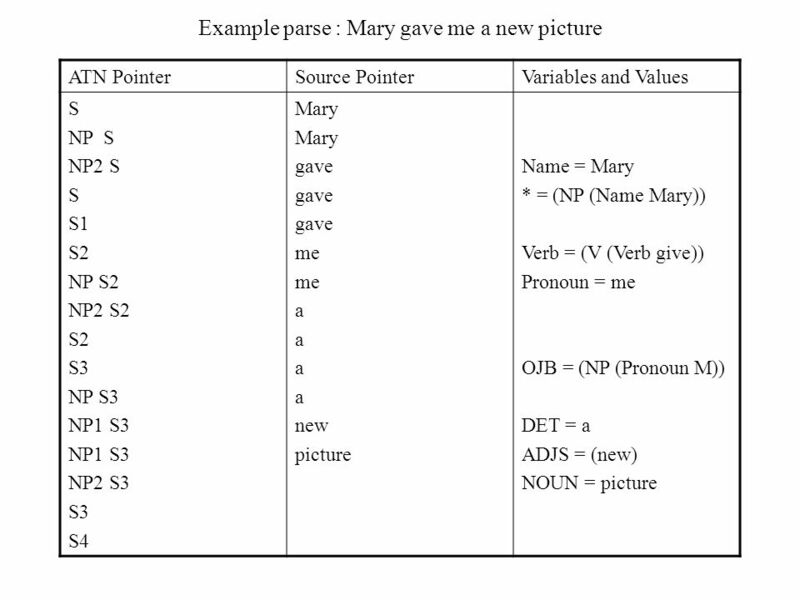 GRAMMAR & PARSING (Syntactic Analysis) NLP- WEEK 4. 1 Pertemuan 22 Natural Language Processing Syntactic Processing Matakuliah: T0264/Intelijensia Semu Tahun: Juli 2006 Versi: 2/2. Costas Busch - RPI1 Pushdown Automata PDAs. Costas Busch - RPI2 Pushdown Automaton -- PDA Input String Stack States. 1 … NPDAs continued. 2 Pushing Strings Input symbol Pop symbol Push string. Courtesy Costas Busch - RPI1 Pushdown Automata PDAs. Syllabus Text Books Classes Reading Material Assignments Grades Links Forum Text Books עיבוד שפות טבעיות - שיעור עשר Chart Parsing (cont) Features. Amirkabir University of Technology Computer Engineering Faculty AILAB Efficient Parsing Ahmad Abdollahzadeh Barfouroush Aban 1381 Natural Language Processing. LING 364: Introduction to Formal Semantics Lecture 4 January 24th. Foundations of (Theoretical) Computer Science Chapter 2 Lecture Notes (Section 2.2: Pushdown Automata) Prof. Karen Daniels, Fall 2009 with acknowledgement. Formal grammars A formal grammar is a system for defining the syntax of a language by specifying sequences of symbols or sentences that are considered.